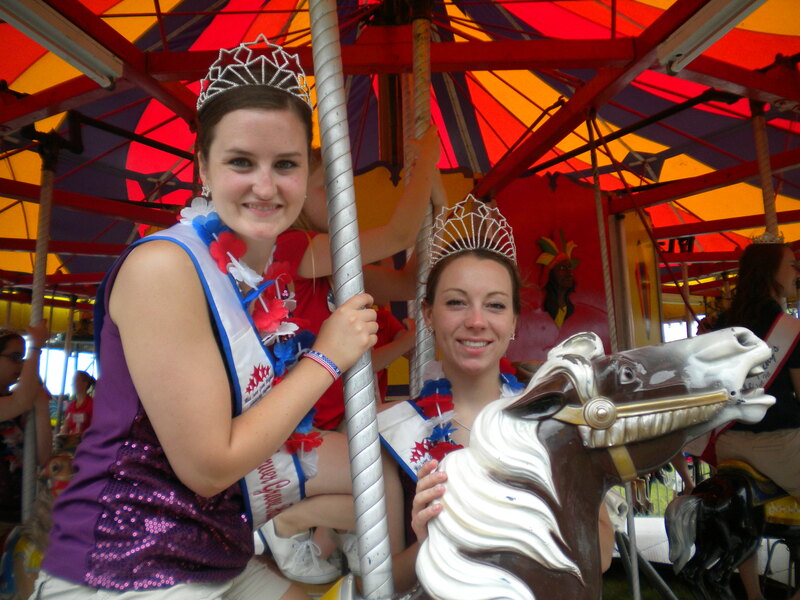 On the Fourth of July my royal sisters and I attended the Eagan Funfest activities which included a Sparkler Breakfast, parade, Royal Brain Freeze, and the Royal Sparkle Ride on a carousel!! It was really cool to decorate our parade float with tons of red, white, and blue, as well as see some of the other floats’ decorations. There is a contest every year at this parade to see whose float best depicts the parade theme. This year’s theme was “Stars and Stripes.” Hopefully our float impressed the judges! We had a lot of fun riding in this parade and meeting and catching up with some visiting royalty, Eagan ambassador candidates, and past Eagan royalty at the pre-parade breakfast! After the parade we headed over to the midway area where the rest of the festivities were taking place, one of which was the Royal Brain Freeze. We ate a bowl of ice cream (with no hands) as fast as we could alongside each other — our Princess Kacie won in our heat! I really enjoyed watching Junior Princess Valerie’s little sister Cheyenne try out her ice cream eating skills, as they opened it up to the public (not just royalty) this year. Despite the fact that I wasn’t feeling the greatest after the mixture of heat and ice cream, we finished off the fun-filled day with a royal ambassador carousel ride. I really enjoyed this sequence of activities and will definitely have to stop by Eagan Funfest next year. Just as the name suggests, it is indeed lots and lots of fun, and I made many good memories!